Madcap occupies a long, low, single-storey white-painted building on the northern side of Fulton Street at its corner with Caroline Place. The roastery/training room has a separate entrance on the left, while the coffee shop occupies the right-hand two thirds, the door at the left-hand end of the space. Smaller than the flagship Monroe Center location, Fulton Street has more outside seating, making full use of the old garage forecourt. There are three four-person tables in front of the coffee shop, a cluster of four armchairs on the corner and a further four-person table down the right-hand side. This layout is mirrored by the windows, with tall windows on the left, followed by a glass rollup door on the right. Finally, along the right-hand side, are more windows, making the interior really bright, sunlight flooding in all day long due to its south-facing aspect, although the projecting, flat awning at the front provides some respite from the sun. Inside and out, a black and white colour scheme dominates, offset by a red concrete floor. The door is inset into the windows on the left-hand side, with a two-seat window-bar to the left, and a five-seat window-bar to the right, seating provided by narrowly-spaced, fixed-height black stools bolted to the floor. The counter is on the back wall and, starting on the left, occupies maybe two-thirds of its width. You can sit here on more of the black stools, a wide, white-topped projection allowing you to get your knees under the counter-top. In all, there are six stools along the front, three more down the right-hand side. The remaining seating is around the edges, with a single two-person table to the right of window-bar, followed by a long, padded black bench running under the two windows at the side and a little way around the back wall. There are seven two-person tables along the right-hand side and one along the back wall, all with wire-backed chairs. Finally, there’s a standing-only table/bar in the centre between the windows and the counter, which also has takeaway lids and a water station at the far end. The till is directly opposite the door, with a small pair of shelves on the counter-front, filled with retail bags. The menu is on the wall behind the counter, with the coffee choices on a printed menu that you can pick up and read at your leisure. The rest of the counter is given over to coffee-making, starting with the nitro taps, followed by the pour-over section. In contrast to the Seraphim Brewers at Monroe Centre, Fulton Street has a pair of Modbar pour-over modules, while at the right-hand end, there’s a La Marzocco Linea, which, along with its two grinders, faces the right-hand wall. Madcap changes things up on a regular basis, with a different second option on espresso every day or so, while the pour-over choices change every few days. During my visit, there were an interesting pair of micro-lots exclusive to Madcap from the same farm in El Salvador. The first was a naturally-occurring varietal found by the farmer, while the second was from trees seeded from the original. Both were available as pour-over, with the original on as the second espresso, so I decided to have that. 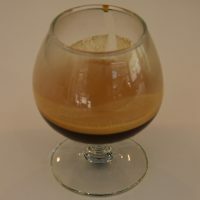 I started by tried it as a pour-over, served in a lovely ceramic mug, followed by the espresso, served in a snifter glass. As a pour-over, it was a very fine, rich, fruity coffee, while as an espresso, it was very different, the acidity accentuated over the fruitiness, but with much of the same underlying taste.